Despite all my good planning, the blogging schedule has been interrupted already. For all the best reasons but this post is technically about a recipe I tried yesterday and I'm making yesterday's pre-blogged recipe tonight. The interruption was very welcome - the lovely Allison Patrick hosted a special meeting of the Edinburgh Cake Ladies because I was holidaying very close to her house. Because I'd intended on making the husband try something different for tea, I switched to a new breakfast recipe for myself and Miss A yesterday and let the hubby have a (rather dodgy) lunch in a chippy. And then I went out and ate lots of cake and had a really good time. The recipe for today (yesterday) was inspired by a BBC Good Food recipe. Pancakes used to be staple weekend fayre for Miss A to help me assuage the guilt of not being with her for breakfast Monday to Fridays because I'm already at work when she gets up. She then got fussy and stopped eating them. Since then, I've tried a number of recipes to try and tempt her but she's having none of it. And today's recipe met with a similar reception. Personally, I liked this batter. 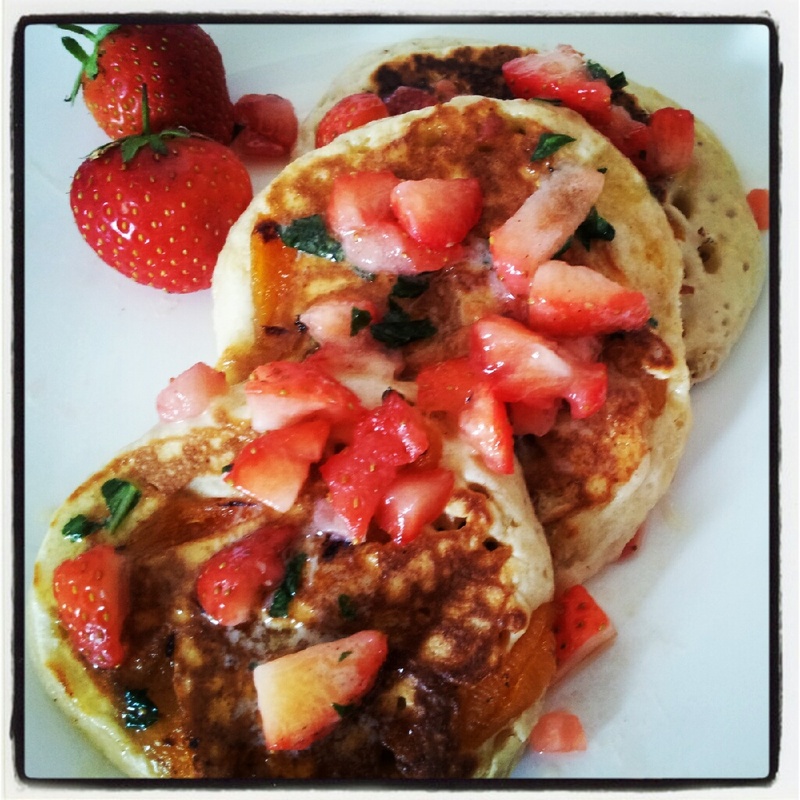 It was the perfect consistency, simple to make and produced light and fluffy pancakes. Abigail took hers from her plate, turned them into drums, pounded on them for a while, picked out the apricots and then fed the remains to her stuffed toy rhino Rocky. Because I had no honey (probably a crime in Scotland!) I made use of the leftover basil from Monday's dinner and some strawberries to make strawberry and basil butter. This gave them a lovely fresh taste, despite being packed with dried fruit rather than fresh. Mix the basil into the butter then carefully press the strawberries into the mixture. Mould into a log shape, wrap in cling film and pop in the fridge. Mix the flour, bicarb, baking powder, sugar, egg and milk together to make a thick, smooth batter. Fold in the apricots. Heat the butter in a frying pan over a medium heat. Once melted, drop tablespoonfuls of batter into the pan, leaving space to spread. Cook until firm and browned on the bottom then flip over and cook for a further two minutes. Once all the pancakes are cooked, remove the butter from the fridge and carefully slice into circles then use to top the pancakes. Now I'm liking the sound of these - I'll have Miss A's pancakes - please! And strawberry and basil butter, what a magnificent idea.